In this article, we will attempt to compare a shipping container home to a manufactured home. Naturally, I have a strong opinion about manufactured homes but I’ll do my best to keep neutral in this article. Browsing the web for manufactured home remodels lead me to an article about a couple in Louisiana that took two shipping containers and turned them into a gorgeous home. How awesome is that? 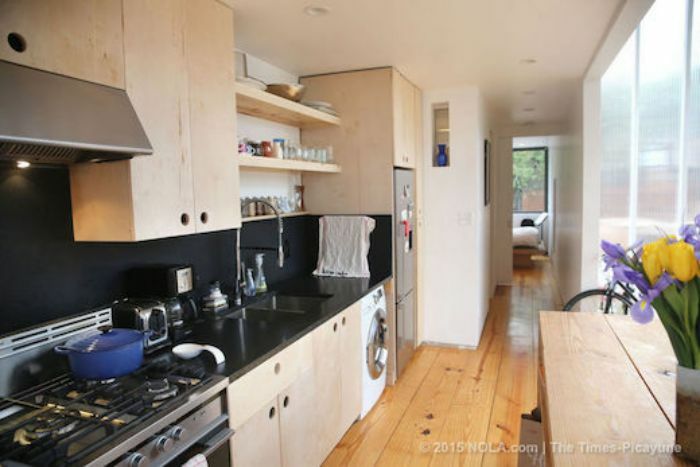 They essentially took trash and repurposed it into a home and it only cost them $200,000! Shipping container homes have been a popular trend in the last few years. People love the idea of taking an old corrugated metal shipping container, 40 foot long and 8 foot wide, and turning it into a stylish, modern, and very tiny home. I can’t help to wonder why anyone would choose to spend hundreds of thousands of dollars to repurpose a shipping container into a home when they could have bought a manufactured home with basically the same shape, size, amenities, and features at a quarter of the price. Don’t get me wrong, any new home for a family is awesome. A home is a home whether it cost $5,000 (like ours in WV) or $500,000. Getting to choose exactly what kind of home you live in – from the layout to the color of the trim, is an amazing, life-changing experience. To compare a shipping container home to a manufactured home may open up the discussion as to why shipping container homes are so cool and trendy while manufactured homes are stigmatized. I think we can do that with respect for all choices. Shipping container homes are not cheap. 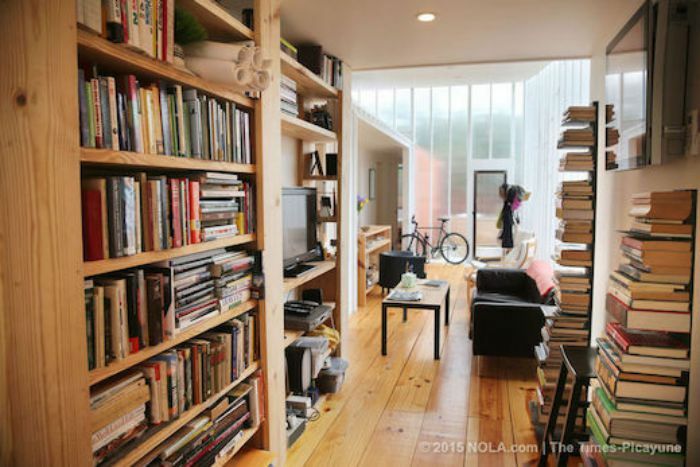 Seth Rodewald-Bates and his wife, Elisabeth Davies are a Louisianna couple that used two shipping containers to create their dream home. The total cost of the project was right around $200,000. The land was $5,000 and the 2 shipping containers were $5,000 each. The other $185,000 was spent turning the containers into a home. Recycling two shipping containers and turning them into a stylish, modern home is commendable. This is not a project for the faint of heart. It takes a lot of planning and preparation to achieve what this couple has achieved. The home is roughly 720 square feet but it still has enough room for a kitchen island, five chairs, a sofa, a 10-foot desk, two bikes, and a set of bookshelves that hold over 400 books. One of the best features of this shipping container home is the 14′ ceilings. The interior of a shipping container home is long and narrow, just like a manufactured home. A narrow but well-designed kitchen in a shipping container home. The couple decided to leave the original markings on the outside of their new shipping container home to keep the look original. Rustic metal is the new trend for siding. We found this great home on a neat architectural site called Jetson Green. Single wide manufactured homes are probably a popular resource for architects when they plan shipping container homes. The manufactured home industry has certainly perfected small home design and layout over the last 90 years. 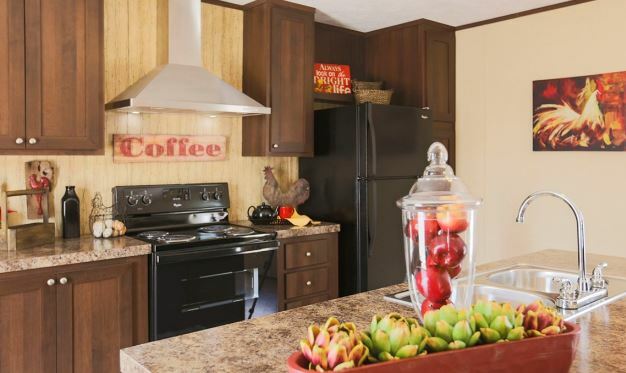 Kitchen in a new single wide manufactured home that costs less than $50,000. While you can’t get 14′ side walls in a manufactured home, you can get cathedral ceilings. if we compare a shipping container home to a manufactured home in the area of permits and restrictions, the shipping container home wins hands down. Container homes have fewer permitting, building, and installation restrictions than manufactured homes. Container homes do not have the history of manufactured homes so there’s no stigma impacting them. They will be welcomed in many communities and developments. Many townships and cities won’t even allow a single wide to be installed within their city limits at all. Double wides are a bit more acceptable but they will typically have a long list of requirements that must be met before they can be installed. Common requirements are porch or decks that make the homes look more site-built and specified skirting materials. Shipping container homes are the clear winner when it comes to permitting and regulations. Manufactured homes have a much lower price per square foot than a container home based on similar specs. David Price, a shipping container architect, says he can construct a container home for about $175 per square foot whereas a site-built home is around $225 per square foot. The average manufactured home costs $28 per square foot. Financing a shipping container home isn’t as easy as financing a true site-built home but it’s not as difficult as financing a manufactured home. If the shipping container is attached to the foundation is easier to obtain traditional financing. There are also grants available because of the recycling and environmental benefits of turning a shipping container into a home. Financing a manufactured home isn’t easy. Thanks to predatory and subprime lending practices over the years the manufactured housing industry has suffered from high bankruptcy and foreclosure rates. Add a fear of low equity returns and a blatant bias and ignorance about the homes and you get a situation where it is difficult to find competitive financing. Read more about financing a manufactured home on HUD.gov. Simply put, manufactured homes are definitely the winner in the cost per square foot. Shipping container homes have an advantage in financing options, though. There are benefits and advantages for all homes. In this case, I have to let my bias shine and declare manufactured homes as a clear winner over shipping container homes. My reasoning hinges on the cost per square foot though I figure if shipping container homes have just as much trouble getting financed as a manufactured home (and at similar interest rates) you’ll probably be better off just buying a manufactured home at a lower cost. You can design and choose your layout in a manufactured home just as you can a container home. Energy savings and environmental benefits are comparable. The stigma just isn’t attached to container homes and that’s not enough of a reason to pay triple the price to me. How about you? What do you think about shipping container homes? This is the most disgustingly biased article I have ever read. As the owner of a shipping container construction, this is a grotesquely skewed opinion piece. Let’s set some facts straight. Design and Style – Anything is achievable with a container home. A simple pinterest or google search will show that the possibilities are endless, and due to the awesome strength of the components themselves, much more intricate designs are possible than have ever been achieved by a traditional manufactured home. 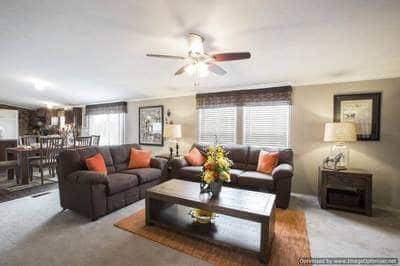 Our home are STANDARD with granite, LED lighting, hardwood lower cabinets, real wood flooring throughout, base door and crown molding, industrial AC and Cabinetry, and TONS of other high-end, custom features mobile homes can’t come close to. As far as flexibility of design, go head up to the mobile home factory tell them you’d like to sit with their designers and fashion a custom home. I doubt you’ll get anything but a laugh in the face and ushered of the premises. Permits and Regulations – Every city municipality we have contacted thus far welcomes us with open arms. For an example of one of our builds, check out 910 Wyoming in San Antonio, TX. You could NEVER bring a traditional manufactured home in to the city, while that specific home stands a block and a half from the Alamodome. Check out the view from the 3rd story, concrete roof top deck. Cost and Financing – Let’s get real here. Real costs. I’ll compare and FHA land home package for a manufactured home to an ISBU (Intermodal Steel Building Unit) home aka container home. 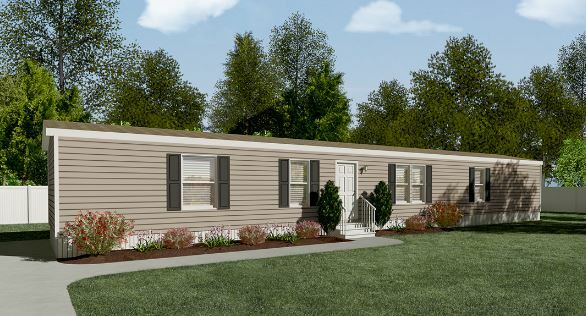 to procure a land home package for a traditional manufactured home of like size to the aforementioned example we built, a double wide of like size will be used for this example. a 1600 square foot home built to HUD standards will never appraise for the necessary financing so it will have to be built to MODULAR code thus increasing the cost due to the fact that they cut some serious corners in HUD homes. The average cost increase is $7500 per section for double wides, and the companies that have their modular license build midlevel to high end homes, the least expensive of which are 85-110K. Land is an unknown variable, but the expenses to improve property will almost always be more on average due to what is required to make the land ready to receive a home. Costs hanging around an average of 35K for a FULL improvements package for raw land. Now let’s talk about a container home. I have 1600 square foot models that I can construct ANYWHERE starting at $140K, and our typical FULL improvements package averages 15-20K so let’s call it 17,500 for raw property. So container home – $157,500 modular home – $132,500. 98.43/sqft vs 82.81/sqft yep, about $16 per square foot difference. Now let’s talk about the COST TO BUY versus COST TO OWN. I have TONS of lenders with below market interest rates ready to lend on my product anywhere in the country, whereas manufactured homes are only financed by a handful of banks. Typically, with an average of 8% interest or VERY high closing costs to offset the rate at which homeowners abandon the $28/sqft model you mentioned in the article due to dilapidation. So even though the amount is less, the payment is MORE due to extra fees. ALSO and more importantly, let’s talk about resale. When the home-buyer goes to sell, they are fed a line about how their home will be a modular and appraises the very same as a site built (the fact they’re trying to compare to it tells you they aren’t even as good as that, but we’ll get there eventually). It is a known and indisputable fact that mobile home depreciate HORRIBLY no matter if they are HUD or MOD. The simple fact is, anything in life is only worth as much as someone is willing to pay and NO ONE will pay more for a used old mobile home than a new mobile home. In comparison, all the models we have produced have sold for more or appraised higher IMMEDIATELY after the owner possession and anytime thereafter. Now let’s chat about what wasn’t discussed strength, cost of ownership and longevity. Container homes are the strongest structures cost per square foot you can buy HANDS DOWN. Nothing else comes close. They exceed ICC commercial building codes exponentially in every measured category, a standard which isn’t even attainable by a mobile home. Installed on the proper foundation, any type of ISBU or container structure is tested to be F3 tornado proof, Cat 5 hurricane proof, 55 x safe in an earthquake than any other conventional structure, and have incredible fire resistance due to the super tight, corten steel shell which also aids considerably in insulation and energy conservation. In summation, if safety, creativity, longevity, monthly payment, resale, usability, cost of ownership, peace of mind and overall quality of life are LESS important than $16 per square foot, then yes, I am inclined to agree with the author. On the other hand, If those things are worth $16, we are here to help. How do you come up with $35,,000 for a Connex container?? They are ~$3000 with delivery. First of all there are no shipping container with a hight of 14′. If you want to build your Shipping Container Home, there are many Counties, Municipalities, etc. that do not approve them, and if they do, they have to make it public to the neighbors, and they all need to vote either for yes or now, and then you can continue with the permits, that are not easy to comply, because you start with a big “NO” beforehand. Of course as everything in life it will depend in the city, municipality, inspector, whoever has to decide if you will or will not get the permit, and always complying with the local construction codes of course. Price wise you can go to amazon and by one for $35,000 or Ebay and buy a Shipping Container House for$87,600 (53′ FT Shipping Container Home -424 Sqft – Brand New – Made in USA). You’ve just misunderstood the article. 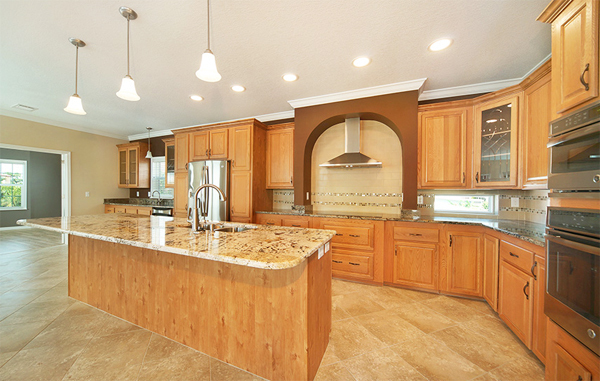 The family raised the ceilings to 14′ during their remodel but thanks for the comment! 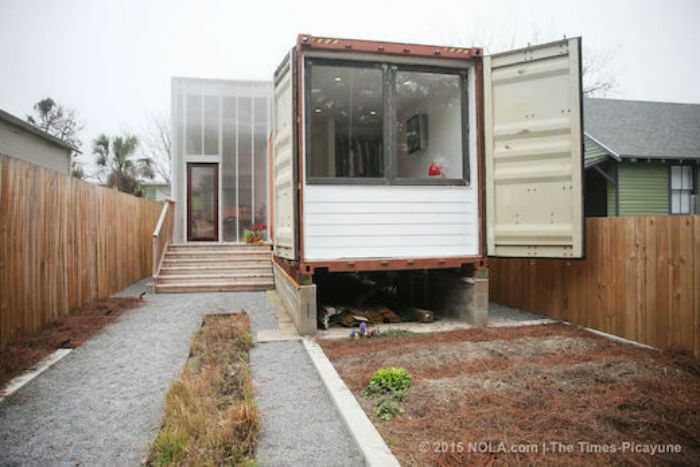 Are you serious that “a couple in Louisiana” actually spent $185,000 on fixing up two 40′ shipping containers? Yes you can find many examples where people spend too much but, this seems very high. Shipping container houses can cost less then conventional homes or manufactured homes per square foot. Maybe this couple compares to people who can afford $300 to $1000 shoes while most of us cant. I buy my $100 dollar shoes on sale for $60 or so and only after the old ones are worn out (very worn out). While we are on the subject, how about the claim that once you cut into the container it looses all of it’s strength? It is true it can no longer be stacked 8 high full of goods and shipped across the ocean. However, they can be stacked 4 high with doors and windows in them. If most of the sides are cut away for extensive windows, it stands to reason that you may only stack 3 high. By the way, how many manufactured homes can you stack on top of each other? Oh that’s right, you can’t. I feel the need to respond to the comment “Now a new shipping container will have to be built to replace the one used for a house”. It cost less for China to make a new one then to ship the container back. So long as there is a huge trade trade deficit with china, the U.S. (along with many other nations) will have a huge surplus of shipping containers just sitting at shipping ports doing nothing but taking up space. This is why it makes sense to use them for something and not just let them sit there unused. Shipping containers are being used as housing in many countries around the world. Manufactured homes are a viable choice and so are shipping containers. I looked for a long time at manufactured vs Shipping Container conversion. The new and the older manufactured just weren’t my style – for the most part, low ceilings, weird (to me) windows, way too much plastic, such small spaces (even in 1700 sq ft), cardboard all tarted up to resemble super traditional interiors, everything I was anxious to leave behind – what I liked about the containers were the simplicity & quality of the materials, the floor plans, the style, their re use of a resource..but of course the cost was wild. I kept looking and found a (California cheap) 1988 Baron, that was already open planned, high(ish) ceilings, an excellent placement vis a vis the sun….and proceeded to tear it apart. Essentially I replaced all the offending materials, new kitchen cabinets, Caesar stone counters, removed the upper cabinets, new floor, new interior doors, incl some ‘sliding barn style, and panelled & painted some of the walls…..very early California Ranch (1949) was my idea and we are real close…. The remodel has been time consuming and there have been a few surprises but overall I can see the end result. I’m glad I kept looking at manufactured/trailer homes. I would love to see (and share) your home! I’ve seen a Baron and the one thing I noticed about it was the high roof pitch. That’s one of the easiest ways to get a manufactured home to look more like a site-built home (if that’s what you want). Unfortunately, most dealerships keep the low and mid-level models on the lots. They will tell you everything can be upgraded but that doesn’t help much – you need to see the upgrades! If you’d be interested in sharing your home please email me at [email protected]. Thanks so much for reading and commenting! I like the idea of re purposing and the containers are an empty canvas to create something amazing………..but it is a trend right now. People will spend ungodly amounts of money on a few containers rather than live in a manufactured home. I bought my 1989 single wide on its own lot owner financed. My home will be paid for in about two years and I am doing improvements myself with the exception of the new metal roof. My home will be paid for in far less time and interest than I would have paid for a stick built house. That makes more sense to me than anything else I could have purchased. Glorified dumpsters for people who like to burn money. Like buying a Cadillac Escalade over a Chevy Suburban. Or a condo over a manufactured home, where you only “own” the air space between the walls. Like $400 jean that look like they’ve been used by someone with an actual dirty job. I’d live in my car before I’d spend the money on a scam like a shipping container, no matter how nice it was inside. Someone truly cognizant of their environmental impact would buy something already constructed and go from there. How many new materials were used just to bring the container to a livable state ? What about the environmental impact of that ? Crystal, your $5000 trailer was the real repurposing. It might have fallen into disrepair and gone into a landfill. Now a new shipping container will have to be built to replace the one used for a house, with all it’s energy intense construction to mine the ore to make the metal, the waste, the pollution to melt the ore and turn it into steel, etc etc etc. Sorry. No environmental cred from me. The mobile home industry has always been efficient and innovative [something the so called “tiny house” movement should study] and is still forward thinking as opposed to the centuries old way of building stick houses with all it’s attendant waste of resources. As well, I’m no “greenie”, but have found my frugal nature is Earth friendly: no buying just to get the “newest” thing when something I have does the same thing and still works. No 4WD SUV to keep up with the trend. I wouldn’t want to have to feed one. I am an “accidental environmentalist”. A shipping container turned into a house is just trying too hard to prove one is environmentally “enlightened”. But it does work well for people who want to tell the world they’ve got money and they’re “woke” to the plight of the “plan-it”. Sorry. I’m not buying into it. Part of a move to lower expectations when it comes to housing. Builders can’t or won’t target first time buyers like William Levitt. And entry level buyers won’t overpay for the sort of crap shacks being built that they mortgage their lives forever to say they “own”, if they have a lick of sense. So what we get is the glamorization of tiny houses and trash receptacles as full time living possibilities. I’ll take the “trailer” stigma and raise them money in the bank and no debt. And a little architectural design.